Liberty. Dresden. What’s not to love? Yeah, I knew you’d get it. Maybe only those with such a need for the aesthetically pleasing that they wander through blogland searching for it, really get it as we do. Liberty Tana Lawn is quite honestly the diamond of fabric – silky soft, so bright and pretty your heart aches, and such magnificently classic prints that I swear they will NEVER date. Never. 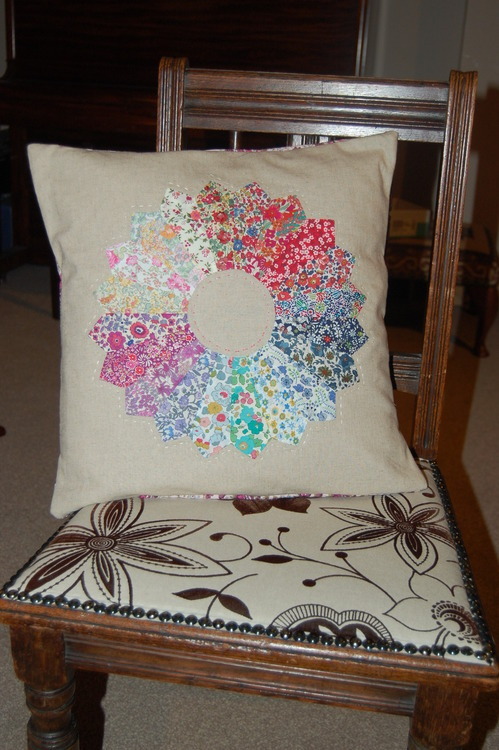 Are liberty fabrics expensive? Oh, you bet they are. But did I say they will never date? So, an investment then. And that’s what I’ll be telling the Hubster when he works out how much Liberty has suddenly entered this house. I even got myself an EZ dresden ruler last year , but had never used it. So when my sewing friend Alison had had a hard week, I invited her over for our first (and hopefully not last!) 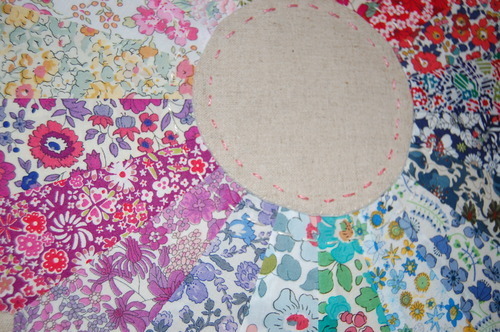 sew-therapy session. I knew just what I wanted to do. 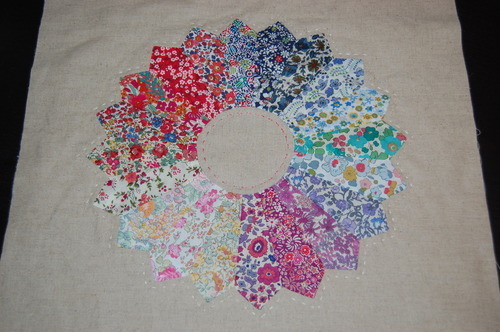 I bought a Liberty charm pack fromPickClickSew on Etsy and added a few more prints from my stash until I had 20 x 5” squares. With the Dresden Ruler I cut 2 wedges from each square, so when Alison came over we each had a pile of 20 wedges ready to get started on. And we did. 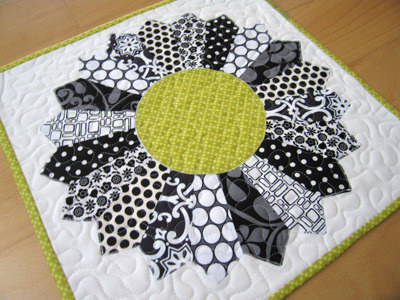 She made this black and white doll quilt, rather than a cushion, but the principle is the same of course. 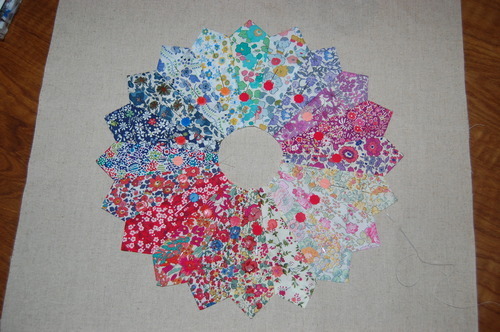 The zigzag applique made a kind of outline effect, which is really pretty. 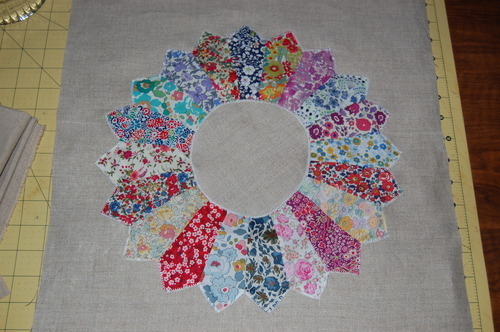 Amazing how all the fabrics just look great together. 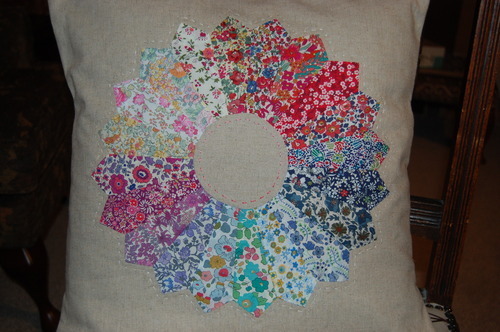 Her cushion front was finished well before mine! 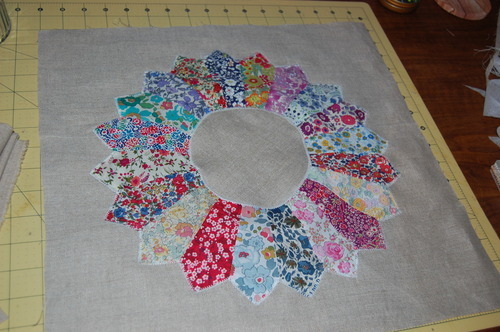 … and then after a couple of hours watching a film, I’d stitched on the dresden and inner circle, added some cotton batting to the back and lightly handquilted with perle cotton – just a simple running stitch around the outside, and either side of the inner circle. 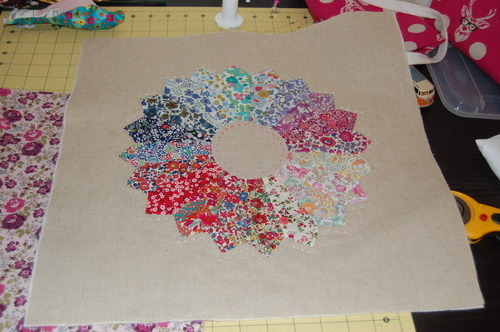 It looks surprisingly like it’s pieced onto the background, it really doesn’t look like applique. 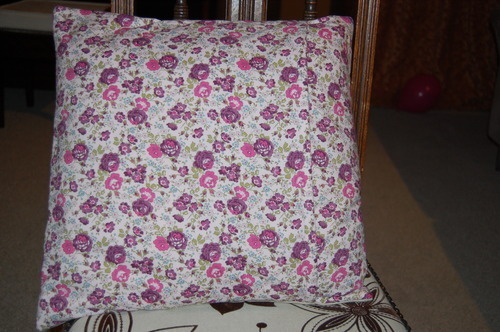 It’s taken me almost a week to finally decide on the back – and I decided to splash out and use this lovely piece of purple liberty which I had. 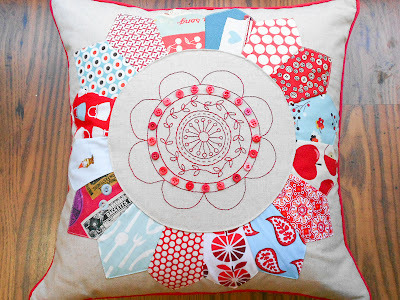 It would be so easy to cut corners or scrimp on fabric and then end up with something I don’t love as much as I would have; I’m not making more of these for our house, so it might as well be as close to perfect (in my eyes!) as it can be! 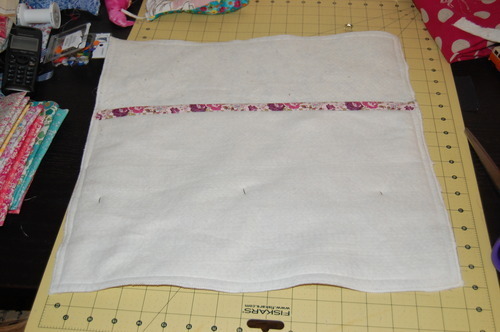 I went with an envelope back, very simple to do of course – cut 2 pieces of fabric which when overlapped will make a 17” square to cover the cushion front, like 17” x 14” and 17” x 11”. 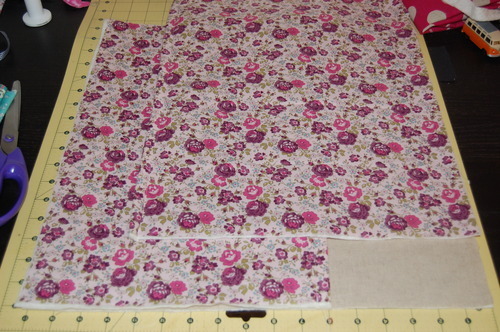 I pinned mine to cotton batting as the Tana Lawn is very lightweight fabric and I wanted to match the weight of the front. 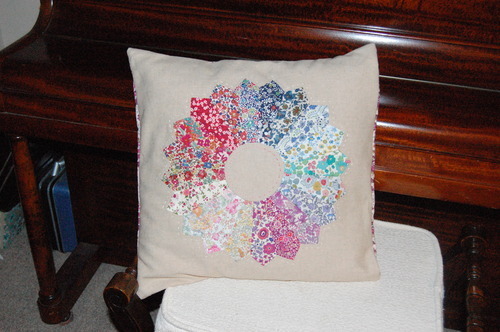 There is a significant overlap as you can see, otherwise the cushion gapes, especially without a button closure, but you can have a smaller overlap and add a button, poppers, whatever. Double hem the two edges which will be in the centre, lay the big piece over the smaller, or however you want the back to look when it’s finished, and pin together. 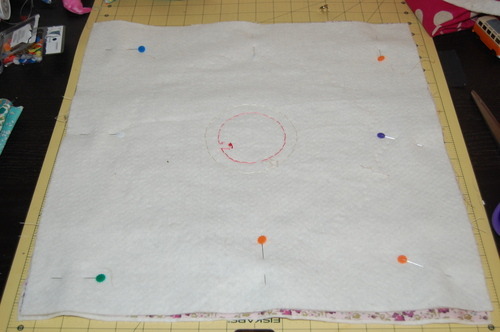 Sew all round with 1/2 ” seam allowance, then zigzag the edges to prevent fraying. My piano and my Liberty Dresden Pillow. Ahhhhh. Whatever you’re up to this weekend, hope you’re having fun!